Here is a great new smoothie recipe that is not only good for you but tastes sooo good! I have been on a bit of a smoothie kick with the new year starting and trying to eat a little healthier and exercise more. Mixing the strawberries and raspberries together make such a great flavor and I thought it might be good to add some granola in there to add a little crunchiness to it. I recently bought this new granola from Quaker…called Real Medley’s which has dark chocolate pieces, cranberries and sliced almonds added to the granola. It is so tasty just as a snack on its own. I also sometimes add it to my yogurt. 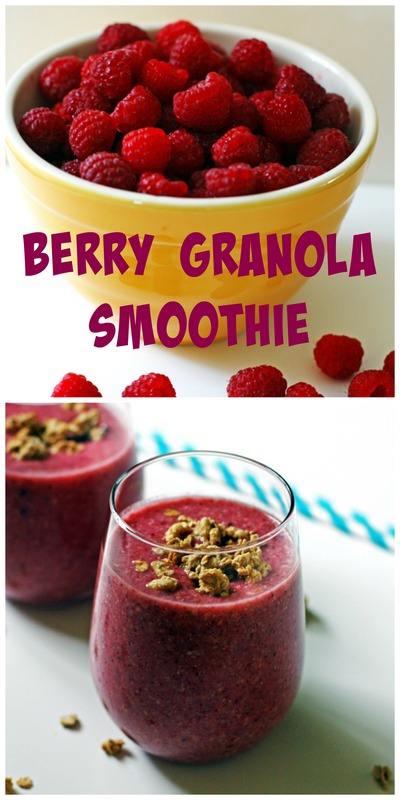 This is the granola I added to my smoothie. They have a few different varieties, but this one is my favorite…probably because it has a little chocolate in it. Hey, they say dark chocolate is good for us, right? Just mix together the almond milk, one cup granola, strawberries, raspberries, ice and flax seed in your blender until all the ingredients are combined well. 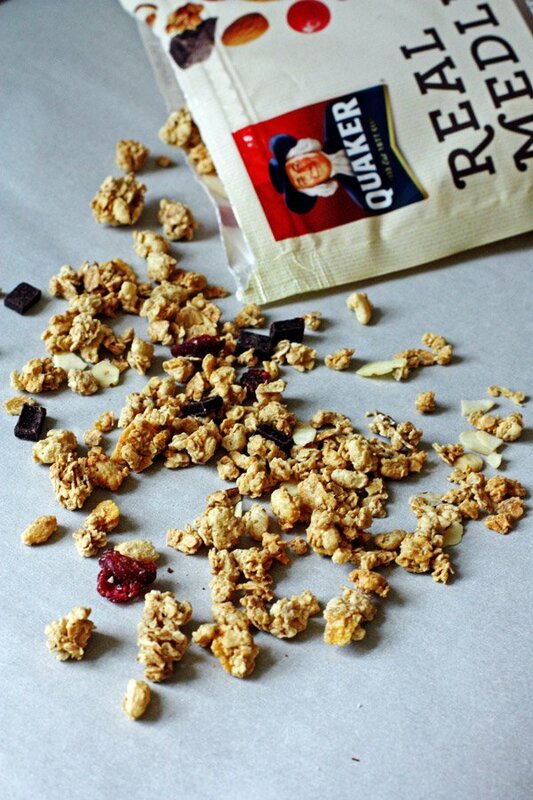 Once poured into your glasses, sprinkle some granola over the top for a little more flavor and crunch. The berries can be fresh or frozen…whichever you happen to have will work. I bought strawberries and raspberries last summer and froze a bunch. Now I am starting to run out and wish I had picked more! When we went blueberry picking last summer, they offered us a basket of blueberries at a great price because it was the end of the night. I really didn’t want to buy them because it was sooo many blueberries, but my husband thought it was a great idea. So, we bought them. Well, my husband was right! It was a great idea to buy them…so good that by now we are almost out of them and I wished we had more! Just a few more months and spring will be here and the farmers market will be open again…yeah! 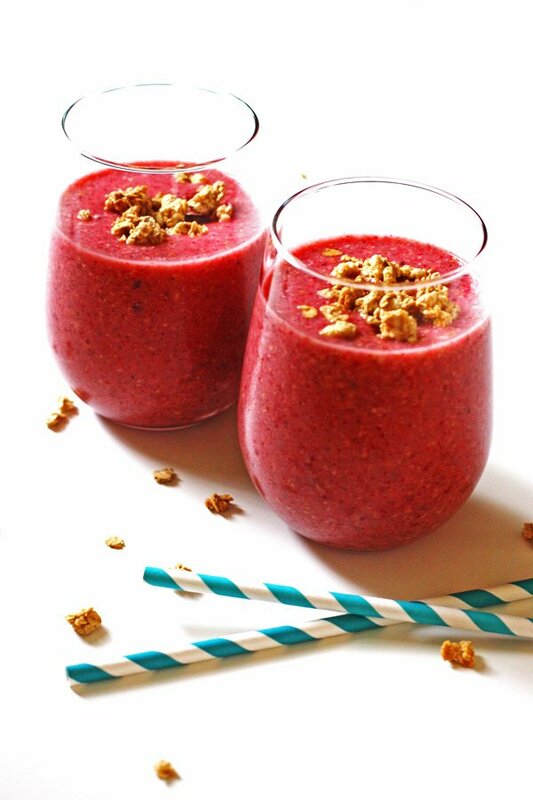 Place the almond milk, one cup granola, strawberries, raspberries, ice and flax seed into your blender. Mix until ingredients are combined well. Once poured into glasses, sprinkle with additional granola (optional). Makes approximately 3 ½ cups.